Our bride, Ashley, loves butterflies, bright colors, fabric, and balloons, which made us a perfect match to prepare her wedding decor. She knew from the beginning that she wanted many bright colors incorporated in all aspects of her wedding from the ceremony to the reception. She chose to get married at her home church and have the reception in the church gym, which many, many brides do. Ashley also wanted her wedding to look much different from her sister’s who had been married just a year or so prior. VERY IMPORTANTLY, her mother had learned that doing all of the planning and decorating made for a very stressful time that she didn’t want to repeat! So, she enlisted our help about 8 months prior to the wedding. We met with them, listened to what they wanted, discussed budget limitations and then proceeded to create decor of Ashley’s dreams. What exactly did we do? Ashley’s desire was to enter the church under an elegant arch and then to proceed down the aisle that was created just for her. Thus, we made that happen exactly. The best way to share is to show you. 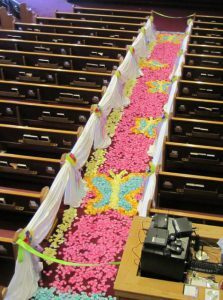 Just after the arch, the aisle was draped on both sides with beautiful, romantic fabric swags, bright, colorful silk flower pew “bows” and 50′ of matching flower petals, shaped into the butterflies that Ashley so loves. To add further romance to the aisle, we added lighting to each of the fabric drapes on each pew. This softly illuminated her walkway. As she walked down the aisle, the butterfly designs disappeared but what remained was a colorful spring mixture of flower petals that was stunning. 250 yards of luxurious white sateen fabric was draped across the 50′ wide pulpit area and was raised 12′ high. This created a very personal look for Ashley as it hid the maroon choir loft and created a neutral backdrop for her eight bridesmaids who were wearing bright colors. We added purple uplights to shine on the wall as that was her favorite color. Atop the wall were fuchsia organza fabric, ribbons, and flowers. Then an additional Bridal Arch was centered under which Ashley and her groom stood. Ashley wanted a completely different look from elegant for her reception. She wanted fun, fun, fun full of flowers and butterflies. So, we transformed the gym into just that! The focal point was a 20’x 20′ dance floor that had four flower columns. Then, overhead were super-sized butterfly imprinted balloons in all of her colors and twinkling lights. 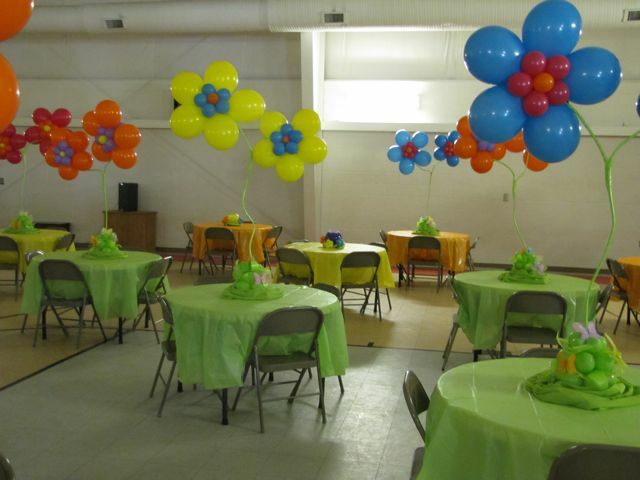 The table centerpieces featured our well-known balloon flowers. Her wedding cake even shouted, “Party!” as it was very bright and covered with party flowers. 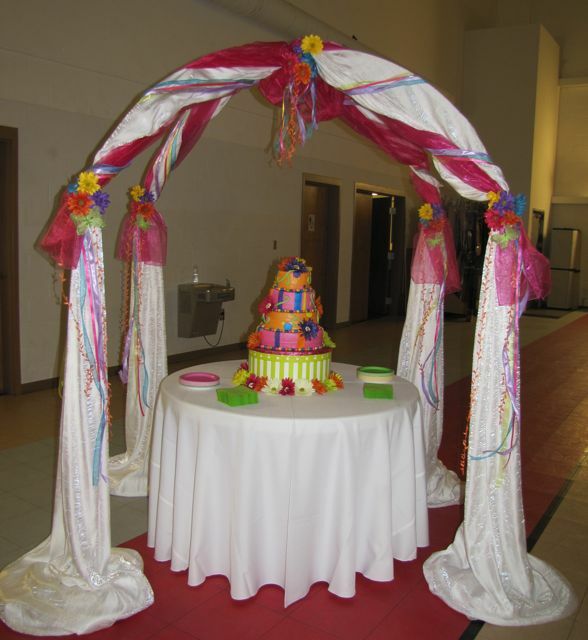 We created a soft, flowing gazebo to highlight the beauty of the cake. Suffice it to say, the mother of the bride and Ashley were delighted as were their guests. Mom got to relax more than she did previously and Ashley got both looks she desired–romantic elegance and PARTY!! Great way to start her marriage. The fabrics we use are absolutely beautiful for draping as lighting just bounces off it creating gorgeous atmospheres. Whether you know a bride to be who wants fun or elegance, we can create that look, and we’d love to take decorating stress off of them and their family. When you refer someone to us you can rest assured that we will take care of them to give them an Above the Rest wedding atmosphere. Visit our website at www.abovetheresteventdesigns.com or call us at (865) 719-8110 to see how we can best assist you. Thanks ladies! We do love draping fabric and have learned a lot over the last several jobs, getting to try a variety of techniques. Of course, we have a place to store the fabric nice and neatly too. It’s all labeled by lengths, folded and stored in plastic bins. It’s high quality fabric, so it doesn’t wrinkle. We love it! Great story, great decor and great fun! You did a fantastic job. Thanks for sharing! Thanks Tammy, certainly appreciate you reading and your encouragement. I love the creativity expressed in these pics. I’m sure Ashley will have fond memories of her special day. Great job, Dianna! Thanks Roberta, it was a fun event to design for and glad we could help make her day.